A few weeks ago, I covered Underrated Books for Top Ten Tuesday and I listed Anya Seton's books as my number one pick. Her novels are historical and relatively old (written in the 40s and 50s), but they are so creative and fun to read. Green Darkness is one of my favorites. Something that I have always been interested in, even though I don't believe in it, is reincarnation. The fact that there is an opportunity to live another life, so different yet similar to the others, is such a fascinating subject to read about! In Book 1, we begin our journey in 1968, with Celia, an American now unhappily wed to an English man. Soon she starts getting strange visions and acting odd and deranged. Celia babbles about King Edward and dancing, then is frozen in an awkward and painful looking position. Fearing for her life and sanity, she is hospitalized. An Indian friend and doctor fears that she is subconsciously reliving one of her past lives, 400 years ago, a life that needed closure. We get a glimpse into this life in Book 2, in the years 1552-1559. We follow a young poor, orphaned girl named Celia living her life under the reign of Henry VIII's children: Edward, Mary, and Elizabeth. We follow her these seven years through abandonment, love, marriage, and ultimately, a gruesome end. What I find the most interesting and engaging is the fact that Celia's family/friends/neighbors/enemies in 1968 play basically the same role in her life in the 16th century. We are swept back to the 20th century for, in my opinion, a less than satisfactory, but sweet, ending. I found that by the time I had reached Book 3 (Conclusion, 1968), I had forgotten all of those characters, so I recommend that after finishing the book, you read Part 1 again. You can make connections and realizations that were missed the first time. I think Anya Seton did a wonderful job at creating a truly originally and well-thought out book. The way pieces tie together throughout both of Celia's lives is so creative. It's an old and rather hefty book, but I promise you, WELL worth it. I have never heard of these books, or the author, but it sounds really good. I've never heard of this author either. I think I'd like this series. I'll check it out. Thanks for sharing! Oh my! I've never before heard of these books, but they are definitely something I'd love. I read this last year. I didn't like it that much. I don't know...but I just couldn't get into it. I love the idea of reincarnation and I do believe in it to a point. Great review! 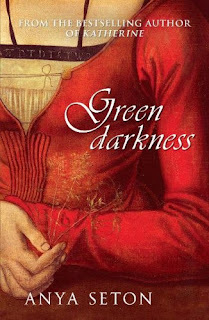 Green Darkness has always been one of my favorite books too. nice review. I too have never heard of these books, but they sound interesting. Thanks for posting! I'm in the mist of a Queen Elizabeth (I) crush, that is slowly expanding into the whole Tudor life. I can't wait to get my hands on this book!